You are here: Home / Is Your Child Stuttering? Stuttering is the disruption to the natural flow of speech and it’s a really common problem in childhood. No-one really knows what causes stuttering yet, although research does tell us that it is often hereditary (about 60% of those who stutter have a family member who also does), but it can also happen when there’s no family history whatsoever. It is likely to be due to a problem with the neural processing (brain activity) that underlines speech production and boys seem to be more prone to stuttering than girls. Stuttering usually starts in childhood between the ages of 2 to 5 years. It often starts when they go through a language boost, where they suddenly learn an enormous number of new words and can’t seem to get them out quickly enough. Sometimes children go through what we call a “developmental stutter”, where for a short period of time, children stutter, but then they grow out of it. However, there is never any guarantee that children will grow out of it and it can become a much bigger problem if left untreated. 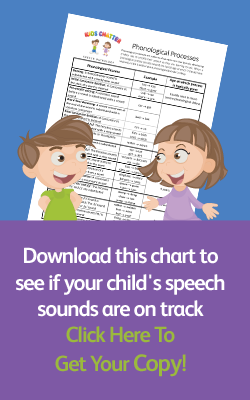 The longer the stuttering lasts, the less likely it will go away of its own accord, and your child could experience a lifetime of struggling to speak. Stuttering often ends up affecting a child’s social skills as they tend to withdraw from speaking to others for fear of embarrassment. This can lead to children having difficulties making or keeping friends and could even affect their school results as they might avoid participating in class. There are three types of stutters and the most commonly recognised form of stuttering is where a child (or adult) repeats either sounds, syllables, words or whole phrases. They can also use prolongations, where they streeeeeeeeeeeeeeetch out the sounds in a word. The third type is called blocking, where they get st—-uck on a sound and cannot get it out. Kids can move from one type of stutter to the next, have only one of the three types, or have all three in combination. It all depends on how severe the stutter is, and how long they’ve been doing it. If your child has any form of stuttering, you should make an appointment with Kids Chatter as soon as possible. Don’t just assume they’ll “grow out of it.” Like any habit, the longer the child has been doing it, the longer it will take to stop them doing it. After the age of six, if the stutter has been left untreated, chances are they will have a stutter for life. They may be able to manage it as they get older, but it will always be there. At Kids Chatter, we’ll talk to your child and find out not only how often they’re stuttering, but also when they’re doing it. Is it each time they talk? Is it only when they’re trying to get their mother’s attention? The anxiety of getting mum’s attention might be causing them to tense up, triggering the stutter. Is it when they talk to strangers? (Stuttering is closely linked to anxiety, which becomes a vicious circle: The child stutters, and then becomes anxious about it, which makes the problem worse.) Excitement and tiredness are often the biggest triggers for stuttering, but there may be others for your child. Early intervention is critical. If they start therapy while they’re under six, there’s a very good chance their stutter can be cured. Stuttering can be a major blow to both their communication skills and their self-esteem, but if treated early, we can help correct their stutter so they can lead a healthy, happy life. If your child shows any signs of stuttering, make an appointment with us as soon as possible. If your child is stuttering, please call us today to arrange an assessment on 0432 735 044.